Gourmet Chocolate Truffles: Best gourmet, gluten-free chocolate truffles with world flavors. Handmade in USA. Inspired by the world. Our gourmet chocolate truffles are always handmade, all natural and gluten-free. We use the highest quality chocolate couverture from Belgium and Switzerland. From there, we get our inspirations from flavors around the world. 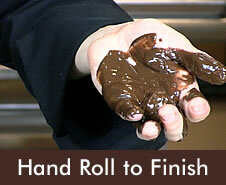 Our unique technique in gourmet chocolate truffle making makes our chocolate extra creamy, and not too sweet. The combination of creamy chocolate ganache inside with the crunchy chocolate outside give our truffles an irresistable texture. One thing taste-testers love about Cocopotamus chocolate truffles is, they look different from old-fashioned fudge. Our gourmet chocolate truffles are not like a slab of sweet, grainy fudge. Instead they are smooth, creamy, darker and less sweet. 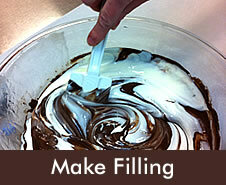 Our fudge is so creamy, in fact, we like to put it into dark chocolate shells. But why fudge truffle balls? We didn't start that way. 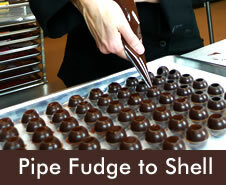 We tried molding gourmet chocolate shells in various shapes & sizes. There were big shapes and small; people like the flavor balance of fudge-to-dark chocolate shell best with small sizes. Next, we tried various shapes. Balls, cubes, pyramids, even. There was a crescent moon phase, and the rather cliched heart phase too, if memory serves. The little fudge truffle balls were the cutest of all, and people told us they had the best punchy flavor. The final thing that tipped us over the edge? Well, we do have a ball making 'em, you know!